In studies Bisabolol (an active compound found within Cabreuva) showed positive effects against the mechanism that have been associated with ulcers. We’ve been so pleased to bring you one of the most rare treasures in the world of essential oils. Cabreuva essential oil, Myrocarpus Fastigiatus, is not only rare in its inherent characteristics and its impact on the body but it’s also quite rare in its acquisition as it has a highly coveted supply. Though it’s relatively unknown among the majority of essential oil producers, this beautifully fragrant oil has long been the subject of diligent scientific and medical research and is considered the “Holy Grail” of the pharmaceutical industry which attempts to duplicate its natural inherent benefits synthetically. To ensure you receive the best quality of this beautiful botanical we insist on harvesting this oil from the wood chips rather than the less effective method of distilling the oil from the watered-down carrier substance of the tree. This ensures that we continue to provide you with the most potent product available. This essential oil possesses a truly unique combination of constituents and in fact, there is no other essential oil out there that contains this high of a concentration of the beneficial nerolidol constituent, a unique member of the sesquiterpenes family. Cabreuva is one of only five known essential oils that possess a double-bond center which enables to amplify any other constituents. In doing so it creates a magnified response of the constituents found in other essential oils making it particularly invaluable in boosting the desired effects of other essential oils. 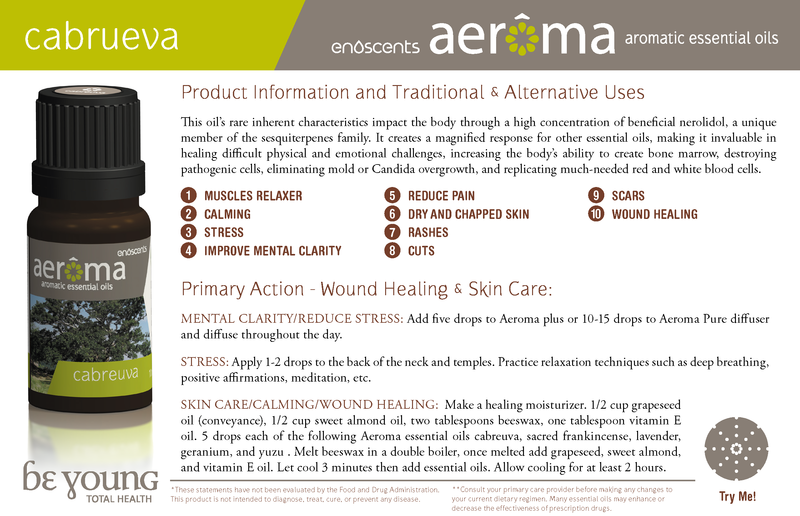 *This oil is indicated as dermal sensitive. Dilution is recommended for topical and interal use. IMPURITIES: This product does not contain solvents (aromatic halogenated....), pesticides, and heavy metals. Antibacterials: Antibacterial effects of essential oil of cabreuva, against both Gram-positive and Gram-negative bacteria. Based on laboratory study, Myrocarpus fastigiatus showed promising antibacterial activity against 11 stains of bacteria. (4). Anti-Prostate Cancer Agents: Studies indicate farnesol a compound found within Cabreuva may introduce a programmed cell death to prostate cancer cells through the PI3K/Akt and mitogen-activated protein kinase signaling pathways. (5).